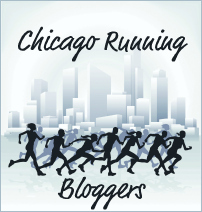 I had not planned on running Chicago Marathon this year. Let me just state that clearly, right up front. And yet, on the morning of 10.10.10, I found myself awake at 5:30AM, dressed in running clothes, with a bib number pinned to my shirt, heading to Grant Park in the predawn darkness. Last year, after running my first marathon, I was elated and overwhelmed. 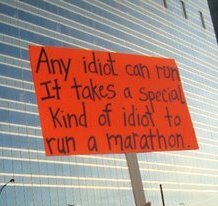 I had spent years watching marathons, always telling myself it was an amazing feat, but something I would never be able to do. And suddenly, in October of 2009, I could call myself a marathoner, something I never thought I would be. My time wasn’t great (5:03) but I didn’t care. My one and only goal had been to get to the finish line. I had run the race with my friends (the same ones who managed to convince me I could do it) and I just wanted to have fun and enjoy it. It was an unparalleled experience. Although I loved every minute of my marathon last year, it was still a struggle; I had not planned on doing it again. My focus this year has been on triathlons (did I mention I did a Half-Ironman in September? ), so the marathon wasn’t on my radar. Then, last spring, someone on Twitter pointed out that this year the Chicago Marathon would take place on 10.10.10. For some reason, that seemed compelling, and suddenly I found myself clicking the “Register” button on the Chicago Marathon website. 10.10.10! Fun! I figured I would be more prepared this time around. I had done it before, I knew what to expect. The second one had to be easier than the first, right? The one thing I wanted was to beat my time from last year. I wanted a finish time that started with a 4. Preferable something under 4:45; perhaps even 4:30-something. But definitely a 4 as the first digit. As I headed towards Grant Park on the morning of 10.10.10, I remembered why I loved the Chicago Marathon. In the midst of a sleeping city, enveloped in darkness, hundreds of runners streamed towards the lakefront. I joined the steady flow of pedestrians heading south. Several of us tried to cut further east, only to find we were caught in a small eddy and had circle back to rejoin the river of people coursing down Michigan Avenue. Each block, more runners joined our migrating school, all of us with matching gear-check bags and excess nervous excitement. It seemed incongruous that dawn was just breaking over Lake Michigan; the atmosphere felt more like a late-night party than an early morning reveille. Thousands of bodies converged together as if at an outdoor concert. Blasting music mingled with the palpable excitement in the air. I got to the start area, checked my gear, and headed to the start corral. I marveled at how many people had come from so far away to run this marathon. The city was hosting thousands of visitors from all over the globe. I looked up at the massive skyline towering above the nearly 40,000 runners milling about below. The sun had finally poked above the horizon and was shimmering across Lake Michigan, bathing the city in soft light. It was a clear, sharp, cloudless day, the buildings outlined starkly against the deep blue sky. Chicago seemed to be making an effort to look her best. I squeezed into the start corral and tried to moved forward through the crowd. I wanted to get to the 4:45 pace group, where I had planned to meet up with some fellow Twitter runners, but the 4:45 sign was behind me and the crowd was too thick to manuever through. I tried to get up to the 4:30 pace group, but again, was unable to weave my way through the crowd to get there. I sighed as I realized I would have to run without a pace group. This marathon I would run alone. Before I knew it, the start time had arrived! It was 7:30! And…nothing happened. As expected, we stood still for several more minutes while the corrals ahead of us started. Finally, the amoeba of runners started oozing forward. Eventually, we hit the start line and we were off. As I began running, I was astonished by the crowds lining the course. I’ve since heard that there were two million spectators lining the course. Cheering crowds mobbed the barricades, 6 or 7 people deep in some places. I got chills as I ran through the streets of Chicago, touched that so many people would come out early on a Sunday morning to watch the elites and then stay to cheer on us back-of-the-packers. The roar from the crowd was deafening; the signs were hysterical. One of my favorites was “Your kids are at the finish. Enjoy the alone time.” This year, since I was trying to run faster, I did not stop to snap any pictures while running. Fortunately, several other runners are better at multitasking than I, and I thank them for capturing some of the more memorable scenes. 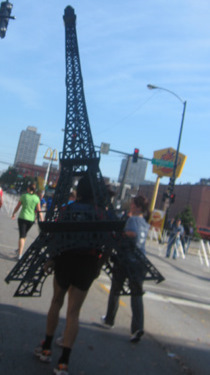 I have no idea why someone was running as the Eiffel Tower. If anyone knows, please leave a comment. If I was touched by the crowds, I was inspired by my fellow runners. There were athletes representing a vast array of worthy charities. I saw dozens of runners with names of loved ones written on their shirts. I was impressed with all the good causes represented out there – Team in Training, DetermiNation, Imerman Angels, WorldVision, PAWS Chicago, and so many others, even the charity I was running for: Back on My Feet. Seeing the runners, and their support networks cheering them on, moved me. There were people running their first marathon, people running their 10th marathon, people in pain, people walking, people breezing by like they were just out to get their morning coffee. Large, small, fast, slow, all trying to get to that finish line. Thousands of people from so many different places, all moving toward the same destination. The first half of the marathon was close to race perfection. The crowds were energizing. The weather was clear, dry, and a mild 70ish degrees. As I passed through Boystown, the roar of the crowd became deafening. There were cheerleaders, superheroes, a faux-military brigade, and boundless energy. I felt light and relaxed. I passed a singing Elvis (who was quite good) and thought to myself “I am having a blast.” It was more like a party than a race. Running this marathon was the best idea I’d ever had. I patted myself on the back for being smart enough to sign up for it. This was the highlight of my racing season. It was, quite clearly, the best race ever. Miles 15-18 slipped by in a blur. The course veered away from the cheering crowds and out into nowheresville. Then the course turned south and I found myself running straight into the hot sun. There were no trees or tall buildings to offer shade. It was like running in the desert. I looked at my pace and realized I had slowed considerably. I tried to pick it up a little, but as soon as I got to the next aid station, I gave back all the time I had gained: I desperately wanted water and Gatorade, so I stopped to take both. When I started running again, my legs felt heavy and tired. My earlier self-congratulatory feelings were slipping away. It didn’t seem like a party anymore, and I was no longer having a blast. I plodded along to the next aid station, once again stopping for both water and Gatorade. I knew walking through the aid stations would hurt my average pace, but I needed the fluids (and I am too uncoordinated to drink and run at the same time). As I approached mile 20, I passed a temperature display outside a bank; it read 93 degrees. No wonder I was struggling (I later heard the official high temperature was 87, but it certainly felt like 93 at mile 20). Having refueled on Gatorade, water and some gels, I approached Chinatown and more roaring crowds. I chuckled that they were playing the theme to Chariots of Fire, and as sappy as it was, it gave me chills. Of course, it is possible those chills were an early sign of heat exhaustion. Once again, the energy from the spectators carried me forward and I picked up my pace as I passed the dancing Chinese dragon. By the next aid station, however, I found myself stopping to walk as I downed more Gatorade and water. I probably should have used more gels and electrolyte pills, but the thought of swallowing anything other than fluids made me gag. I looked at my watch and realized I was starting to lose some serious time. I tried to pick up my pace for the last 10k, but every time I did, I thought I would throw up. I know some people vomit on the course and it doesn’t bother them, but I am not one of those people. I may not have talent, but I have my pride. I stumbled along, my motivation draining out of me with each step. I saw a woman in front of me with a sparkling red cape. I had been with her for a while and I decided I to tuck in behind her and let her pace me. I stumbled along, so pleased that Wonder Woman (as I called her) was there to save the day. Then, much to my dismay, she stopped to walk. No! Wonder Woman can’t walk! If Wonder Woman couldn’t make it through, there was no hope for me, a mere mortal! I looked around for someone else to pace off of. Everyone was walking. I was determined not to walk. I had to beat last year’s time. I couldn’t bear to face another 5-hour finish time. I was demoralized, depressed, and looking longingly at the Runner Drop Out stations on the side of the road. Suddenly the race seemed less like a party and more like a death march. I wasn’t smiling anymore. By mile 24 I was crying. Last year I cried at Mile 24 because I realized I was so close to the end and I was going to make it. This year I cried at Mile 24 because I wanted someone to put me out of my misery. My legs were like lead, it was hot, I was tired. I was starting to see unpleasant things on the course: people throwing up, people having, shall we say, digestive-tract-related issues, people collapsing on the side of the course, race officials sweeping in with wheelchairs to get them. It was more than a little disconcerting. I began to think that this marathon was the stupidest idea I’d had all year, and I have had some remarkably stupid ideas this year (the WaterDaze swim race, my first triathlon, my second triathlon, etc.). But those were nothing compared to how bad this idea was. I was miserable. I decided that I hated running. I hated racing. I hated any and all athletic events of any kind. I vowed that if I survived this misery, I would never leave my house again. Nothing but inertia and laziness for me. Just get me to the finish and I swear, I will never sign up for another race. Ever. Really. Finally, I approached the Mile 26 sign. I picked up my pace, not to improve my time, but just to get the whole damn thing over with. I made the turn to the finish line. As I crossed under the banner, I looked at my watch and realized I had beaten last year’s time by 10 minutes, in spite of the blazing heat. As I looked around at the crowds of tired, proud, and suffering runners, I said “I am never doing that again.” Which, of course, is what I said last year. I wonder when registration for 2011 opens…. You are the best!!!! Just now had the time to read this. I am so proud of you. Hope all is well. We have had a beautiful fall here. The first frost is supposed to be tonite. I must go out today and pick the last of the Dahlias. They were a bumper crop and the best that I have done. Thanks Lori! And when registration opens, please remind me to re-read my own post and all the misery documented therein. You’re nuts! But you’re amazing. Congrats and once again loved reading this (especially since its the closest I’ll ever get to knowing what running one is like!). You are such a rock star. Not only do you dare to take on tough things, not only do you end up doing them so well, but you never lose your lightness, no matter how freaking heavy your legs must have felt! And thanks for evoking the race so perfectly. Hmmm. It’s been ten years since my last one. I keep meaning to go back. You sure you’re done? Keep in mind, I WILL blame this very post if I have a hard time of it. But you make it sound so good, even when it hurts so bad! Hey congrats for bettering your previous time and especially under such rough conditions. What was your time at the 13.1 mark? And when are you going to write your book or get into the running magazine. You’ve got talent! Thanks Elaine. My time at 13.1 was 2:17 – a decent half for me. Too bad I couldn’t hold it. Well, maybe next year?? Wow Sue, what a great race report! I couldn’t handle running in those temps – you are amazing! Well done and congrats! Thanks! What is the saying – what doesn’t kill us makes us stronger? I am feeling pretty strong right now. I had the same problem, I honestly couldn’t keep GUM in my mouth.. THe conditions were realllly bad! I can relate with you on mile 24, just wanting to get it done with! But you did it! Congrats! It’s amazing that you PRed in that, you are a rock star! Congrats Sue! Loved your race report! PRing is the best feeling in the world! Running a marathon in the heat is damn tough. Been there, done that, felt sick, went slow. Tough. Sometimes there’s just no way to know ahead of time when you register how race day is going to come out. Anyhow, you did awesome and you made your sub-5 goal, so yay! Haha about registering again. Yup.